and implacably demanding our money back. online purchasing creeps inexorably higher. align themselves with the FMCG markets. Gearing Media Group Ltd 4 Red Barn Mews, High Street Battle, East Sussex TN33 0AG ISSN No: 1475 - 3731 © Gearing Media Group Ltd 2019 General information No part of this publication may be reproduced without the specific prior written agreement of the Publisher and may not be stored on any type of retrieval system. Furniture News/ Gearing Media Group Ltd accepts no responsibility for variations in colour reproduction. Special colours (Pantone etc) can be catered for with prior arrangement. Some elements of the editorial content in this publication are submitted by the trade, however, all efforts are made to ensure that the editorial remains true to fact and unbiased. Monies may have been accepted to offset the costs of colour reproduction. 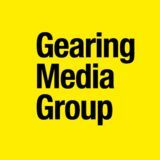 Gearing Media Group Ltd reserves the right to alter without prior notice any content other than customers’ advertisements. No correspondence will be entered into regarding altered or adjusted editorial content. The editor’s decision is final. All material submitted for inclusion in Furniture News is done so entirely at the owner’s risk and no responsibility is accepted for the safekeeping or return thereof. Advertiser information is reproduced in good faith and Gearing Media Group accepts no responsibility in respect of adverts appearing in the magazine, and the magazines expressed do not necessarily reflect the publisher’s views. The Publisher accepts no liability for any loss arising from an advertisement’s late or non-appearance. after the goods are received. I wish you all a productive month – may your returns rates be negligible. Part of the dp-limitless Technical Collection, AE Core is a 0.8mm heat and moisture resistant thermoplastic laminate. This high impact material has been developed for contract environments such as education, healthcare and retail where a tougher surface material is required. Available in quantities as little as just one board. industry is as strong as it should be. lobby for changes on your behalf. We are stronger together. of this in the first quarter of 2019.
of community in the air. in any way you feel is necessary. I have got to know throughout the years of my career in furniture manufacturing. By the second day, we had heard the stories of exhibitors using the first night after the show as a social opportunity, all meeting up as one for their evening meal, alongside exhibitors from different corners of the globe, who told us repeatedly that London Fabric Show was the “most sociable show in existence”. especially in the current climate. members a range of beneﬁts including access to expertise on subjects including export, EU Timber Regulations, health and safety, commodity pricing and the environment. Hull, employing around 280 people. businesses before winding down operations. (ATA) and Levy Management Company. for infringing its intellectual property. their apprentice levy digital accounts. self-employment as a sales agent. product portfolio in the future. and Mark Hammonds (group director). amortisation was up +83.9% to £16m. of goods into the current financial year. co-locating these with existing group assets. which take the findings of PwC’s report into consideration. in the year to 26th January 2019.
liquidity position, at nearly £1.5b – almost double that of five years ago. take place from 12-15th of September (10am-6pm each day) at Romexpo Exhibition Centre in Bucharest. RETURN TO UPHOLSTERY’S HEARTLAND Spring Long Point returns to upholstery manufacturing town Long Eaton, Derbyshire, this month, in an earlier timeslot from 29th April to 1st May. permanent space in Harrington Mill. Other exhibitors include Westbridge, Alexander & James, Parker Knoll, Collins & Hayes, Duresta, Gascoigne Designs and John Sankey. Visitors to this season’s show will have the chance to win an overnight stay for two at Raymond Blanc’s Belmond Le Manoir aux Quat’Saisons Michelin-starred restaurant and hotel in Oxfordshire. 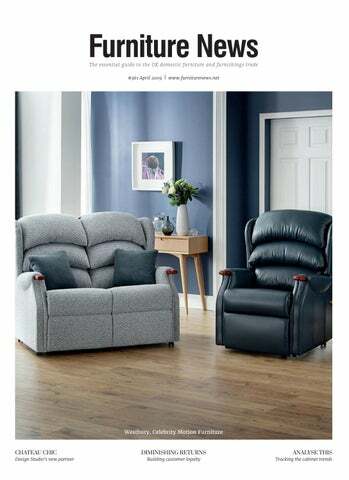 Trade customers can enter by depositing their business card at one or more of the venues (see the brochure on the show website for details), and the winner will be drawn by Maggie Throup MP, chair of the All Party Parliamentary Furniture Industry Group, on 3rd May. Local courtesy transport to and from the town’s various exhibition venues is also available. was no lack of interest in their wares. were equally pleased with the proceedings. Rounding off the experience was a pleasant hospitality package including a free lunch and refreshments, plus a drinks soiree on the Monday evening. The London Fabric Show is an undeniably sociable fixture, offering visitors and exhibitors alike great networking opportunities (see BFM MD Nick Garratt’s column on p7 of this month’s issue) at a time of year in which these are in short supply (this side of the Far East!). This was the final edition overseen by outgoing BFM MD Jackie Bazeley, who says: “I am gratified to go out on a high. This show has become an essential date in the diary for many of our members. It is always a pleasure to see so many well-known and friendly faces at Chelsea, and I’m sure that the show will continue to develop and thrive. We have had great feedback already from this year’s event, and I’m thrilled at its success.” The London Fabric Show will return to Chelsea FC’s West Stand in 2020. VIVA VIFA! The Vietnam International Furniture & Home Accessories Fair (VIFA-Expo) attracted some 12,000 visitors – including attendees from more than 80 foreign countries and territories – when it ran from 6-9th March at Saigon Exhibition and Convention Center (SECC) in Vietnam’s Ho Chi Minh City. strengthen ties with new customers. MALAYSIAN INDUSTRY ENJOYS GLOBAL STAGE The biggest Export Furniture Exhibition (EFE) to date took place from 9-12th March at Kuala Lumpur Convention Centre (KLCC) in the heart of Malaysia’s capital. since its foundation 15 years ago. â&#x20AC;&#x153;The event has not only branded Malaysia as one of the furniture hubs of Asia, but at an international level, tooâ&#x20AC;? 68% choose websites to buy from based on their reputation – and a good returns experience will certainly boost this. more generous than those competitors’. when drivers are delivering in the same area. clear return information with each delivery. customers should return their items. generous as possible, in fact. free of charge, the better. Motte Husson back to life. everything we developed had to be authentic to the chateau. opened doors to new customers. the staff, and everyone fell in love with her! cushions, bedding, furniture and wallpaper. via a national PR campaign in March 2019.
of all your products in a Greenwood Sale. • SELLING SKILLS - Get good at does selling. Most retailers you’re going to see this year? • ADVERTISING – Most advertising not work very well. If yours stop wasting yourprocess money now. blame don’t bother withisn’t, a proper sales orDon’t sales training. The the media, blame the message. Re-design your advertising Would you like to see sales of two, four, six or even successful ones do! Invest time and money in qualityeight sales “For us as a business, this marks a real opportunity to in a benefits-orientated-style. Call Greenwood for effective times what is normally your best month? differentiate and resonate with our customers. We’re moving with know-how.copywriting Call Greenwood know-how. to arrange an effective sales the times and trends and listening to what consumers want. Multitraining course. dimensional offerings are key to growth, and allow us to explore well documented, so there’s a lot of anticipation amongst both consumers and the trade for her first collection. PRODUCTS Be ruthless your precious As• our clients –know verywith well (and willfloor tellspace. you),Ifthe a product or collection isn’t performing after being given a above sales results are not exceptional for a Greenwood and exciting product ranges.” fair trial, then clear it and replace it with a faster selling line. COMPETITION Check your competition to find out what Sale. They are–standard. You could enjoy such recordThe Chateau By Angel Strawbridge may be Design Studio’s first Test and measure the selling potential of all your products in a breaking sales Avoid results all-out too – with high margin collaboration, but the wider Belfield Group has good form in thisthey are offering. price wars. Bemaintained. sure to out-do Greenwood Sale. your competition on the most relevant beneficial USP’s • SELLING SKILLS - Get good at selling. Most retailers don’t including choice, quality, value andforservice. Call The Greenwood employ a proper retail sales process big ticket goods. Furniture News: “Brand tie-ups are easy to buy into. I think they’re successful do. Invest time and money in quality a great way to sell, and this one’s shaping up to be a key player in to mysterymost shop your ones competitors. field, thanks to its work with Mulberry through Tetrad. trends, and share them with our independent and group customers. cash and win market share, while protecting your profit shop future your competitors. at the same time. Call Greenwood! your product – or you can work together to enhance and strengthen opportunity. the brand whilst achieving the product offering that the fans and followers want and expect. • PROMOTION – Promote your business effectively. Every good retailer from Aldi to Harrod’s does. Consider using a Why not callsales me promotion today onto01565 a into free, ‘Greenwood’ increase650101 sales, turnfor stock cash and win future market share, while protecting your profitI can confidential, no-obligation business consultation? at the same time. Call Greenwood! outline sales projections and costs over the phone. From the ashes Businesses rise and fall (with alarming regularity, these days). However, on an industrial estate in Hastings, East Sussex, sofa manufacture is still very much alive. Paul Farley reports … gone a long way, admits Marc. even, but is currently managing closer to 40.
to increase this to around 100 if required. took on some of those existing debts to help maintain any goodwill. machinery, materials and work in progress. forays into sofabeds and motion furniture. customer accounts while opening new doors. and are “ready to go” as and when required. Tiverton is a new living and dining painted collection from Nathan Furniture (www.nathanfurniture.co.uk). Unveiled at the AIS Furniture Show in January, it was well received, with the careful attention to detail seen across the range especially admired. This includes such features as skilfully constructed parquet oak tops and delicately crafted feature pins. According to the manufacturer, the attention to design and detail sets this product apart from other painted collections. Available in a wide selection of hand-painted finishes, Tiverton’s pieces also use a complementary colour for the interior of the product, creating a contemporary two-tone effect. Continuing in its tradition of UK upholstery manufacturing, Mark Webster Designs (www.markwebster.co.uk) launched the Hardwick and Babington upholstery collections at this year’s January Furniture Show. Offering a choice of vibrant velvet plains mixed with dramatic floral prints, both ranges have been added to the company’s lifestyle collection. In addition to upholstery, the company also launched a number of contemporary dining sets, bringing ceramic, metal and glass and concrete to its wholesale collection. Over the next few months, the company plans to continue the development of its Lifestyle & Loft upholstery collection, as its UK manufacturing operation enters a new era. Hamlet Fibreline’s (01535 606846, www.encorecushion.co.uk) latest cushion, Encore Foam, has been awarded the FIRA Gold Award. The latest Encore cushion is claimed to have a sit just like a fibre cushion, and to offer a sink-in, snug feel. Like all Encore cushions, it is also easy to maintain. Fibreline believes Encore Foam to be the ultimate foam cushion. It is constructed from 100% foam and achieves its impressive properties through a combination of foams and a clever interior profile. With the launch of Encore Foam, Fibreline feels confident that it can now offer the very best in foam, fibre and feather cushion interiors. latest design, fabric colour and texture trends. sturdy stainless steel frame adds a modern touch. padding on the backrest adds to the detail. Armrests allow for greater comfort whilst sat at the dining table. driven promotions and in-store events at high-street, out-oftown and internet-only retailers. modern, well-proportioned, naturally finished oak furniture. THINKING BIG, FROM MOROCCO TO BROOKLYN Think Rugs is significantly expanding its product range with the launch of almost 100 new products across 15 ranges, all available in a huge selection of sizes. This year sees the launch of five unique product ranges, plus plenty of new additions to Think Rugs’ most successful collections. the uncomplicated Royal Nomadic 5413.
and dramatic, these new additions are sure to shake things up. From Essentials by Kettle Interiors (01536 444960, sales@ kettleinteriorsagencies.com) comes BP, a highly competitive painted bedroom collection. With no pricing policy, BP offers an opportunity for price-driven promotions and in-store events at high street, out-of-town and internet-only retail operations. Offered in a choice of enduring paint finishes – classic white and moonlight grey – BP brings clean, simple sophistication to any bedroom. With sculpted cornices, elegant feet and finished with pewter-effect handles, this 12-piece collection (in both paint colours) is ready to make bedrooms more attractive, at affordable prices. The BP collection is available from UK stocks for fast nationwide delivery through the Wholesale, Stockist and Container service packages offered by one of the country’s largest furniture suppliers to the trade. four beds featuring Defined Edge Support. or champagne for the door fronts. knowledge, an understanding of the UK beds market and any jargon involved, and is extremely competitively priced. Its Sleep Sales Course, meanwhile, is available in two formats – the Express version for store managers, those whose main role isn’t sales or busy salespeople who need to learn quickly. materials to improve the comfort and longevity of each product. improved sleeping experience, along with luxurious support. The company delivers weekly, making its service popular with stockists lacking storage space. Copper is an excellent thermal conductor that rapidly transfers heat away from the body. Additionally, copper is anti-microbial and is thought to promote health and wellness. available to independent furniture retailers. you pay more LFL because of this. choice of classic white and moonlight grey. their Wholesale, Stockist or Container order. home, fulfilling the needs of today’s consumer. The Ayla line also includes the Horizon lounger, Dune chair, Drift chair, Oasis loveseat, Mirage pouffe and Halo pouffe. and a high level of customer service. and meet changing customer demand. Furniture testing and certification SATRA is an international centre of excellence for product testing, training, consultancy and innovation celebrating 100 years in business and 21 years of furniture testing. Working to ISO 17025 and offering expert technical advice on UK and European standards, SATRA is the premier technical partner for suppliers, manufacturers and retailers of furniture. SATRA Diamond Product Certification available for products that meet extra quality standards. to weigh in with insightful explanations. for and what is being offered,” says Paul. how to proceed with product development. economy, cannot be a bad thing. SATRA LOOKS TO THE FUTURE UPON CENTENARY This year, SATRA celebrates 21 years of furniture testing, and 100 years in business. SATRA was formed in 1919, and has since become a recognised and respected name for product research and testing in supply chains throughout the world. The organisation introduced furniture testing to its broad offering of technical services 21 years ago, and since then many of the test mechanisms developed for the footwear and chemical testing sectors during SATRA’s long history have been applied to furniture. testing – including whole mattress testing. at SATRA, as there is potential in the whole market. exposure and even faster turnaround. Academy Associate Certiﬁcate awarded upon completion. We are the Digital Artisans Crafting high performing eCommerce websites for our clients since 1997. Cypress hand-turned bowl, Rodney Band From his workshop near Cape Town, South Africa, Rodney Band crafts unique wooden bowls from cork oak, Norfolk pine, wild olive and more, and spends around seven days working on each creation. otherwise have ended up as firewood or rotting in nature. “My hand-turned wooden bowls have a unique beauty that’s testament to the individuality of the tree that gave birth to it” Training: Rodney had a passion for wood from an early age, and began exploring the art of woodturning in the early 90s. He went on to pursue an apprenticeship with Dave Stevenson, a master woodturner in South Africa’s Cape Garden Route, where he learned the techniques of hand-turning and hand-sculpting wood on a lathe. Achievements: Rodney is represented by the Southern Guild gallery in Cape Town, as well as the Kalk Bay Modern and Ebony Curated. Become a NBF Retail Supporter and together we can put rogue traders to bed. The NBF is ﬁghting back – investigating dubious products and businesses and reporting our ﬁndings to trading standards. Rogue traders continue to steal business from legitimate bed manufacturers and retailers. They dupe people into buying products that are simply not what they claim to be. Furniture News is just one of the industry titles published by Gearing Media Group. Those involved in the contract furnishings market should take a look at Hospitality Interiors magazine (www.hospitality-interiors.net), while anyone seeking furniture manufacturing machinery or supplies should refer to Furniture Production (www.furnitureproduction.net).